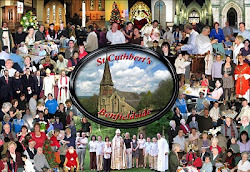 St. Cuthbert's Calendar - what's on? In terms of the Church’s Calendar, this February offers us a bit of time off. The season of Christmas and Epiphany ends with the Feast of the Presentation of Christ in the Temple (Candlemas), which we will celebrate on Sunday 3rd February. Then it’s “Ordinary Time” until Lent begins on Ash Wednesday - not until 6th March, because Easter is so late this year. I don’t remember when we had quite so much time to fill in between the seasons - but it will be no bad thing! Time to take stock, I hope. I thought of encouraging people to prepare for Lent - but actually Lent is the time you prepare for Easter, so we should think of more than preparation. So I’m going to see the weeks around these four Sundays as time just to set a rhythm for daily living: “Ordinary Time,” we call them liturgically - or you might think of them as “Empty Time,” and ask just how can I fill them wisely? Work can be self-generating. Clear a space in your busy diary and it can easily fill up with clutter. I’ve had enough of the wrong sort of busy-ness recently, not least in lots of correspondence, discussion and form-filling to do with our plans to install a new heating system. We’ve now reached the point where I think we’ve done all we can. Now there’s a period of “Public Notice” lasting 28 days so that people can know officially what we intend. Then hopefully we can get on with the job. And it will be Lent by then probably. I hope that the new system will be running before Easter - it would be good to walk out of the Hall as we usually do for our Palm Sunday Procession, enter the church - and stay there! But first some time to pause - can we use it to listen to what God is saying in gentleness and peace? From the February issue of the Parish Magazine - click to find it online! Arrangements for Baptisms, Marriages, etc. should be made with the Vicar - catch him at a church service or phone for an appointment. For Spiritual Advice & the Sacrament of Reconciliation (Confession), please contact the Vicar.